That’s essentially the question raised by Katrin Verclas on MobileActive, and it’s an excellent one. Specifically, Katrin calls out the new Google Trader service offered by Google in Uganda, in conjunction with the release yesterday of their SMS products with Grameen and MTN Uganda, one of the local mobile phone operators. Basically, they charge 220 Ugandan Shillings per use, instead of the median 110 UGS charge across most networks. This is called a premium SMS rate. Premium SMS rates are charged so that third-party service providers can make money off of services that they provide over the mobile phone network. The operator makes their (ridiculously high) profit as normal, and the overage is for the third-party. You’ll find a lot of dating, event and sports services offered in this way all over the world, not least across Africa. The question posed is if people who are claiming to help the poor should charge, and if so, should they make a profit? I think we’ve seen from the Grameen model in Bangladesh (ex: Grameen Bank and Grameen Phone’s Village Phone program) that you can (and possibly should). By doing so you help both parties; first, by providing a service that consumers value and are willing to pay for, and second by making the business of running an operation self-sustaining. Many good business, or project, ideas die due to lack of sustainable cash flow. For instance, if a 220 shilling SMS can save you the 1500 shilling visit to the doctor or veterinarian, or give you a 10% higher return for your crops, is it worth it? Is there a problem in the question? There ends up being a paternalist nuance to that original question. After all, is it up to us to decide what services to offer the poor and at what price? Aren’t poor people able to make the value-based decision on whether a trip to the doctor is more useful to them than a call or an SMS to one? If services are being offered, the person making the decision to call, SMS or go physically to solve their problem, or not, is ultimately the arbiter of whether or not a service has merit and should be offered. It’s a classic market-led approach – if the price is too high for the service, equilibrium will not be reached and one will give, usually price. This is particularly true when talking about for-profit companies offering services – like Google is with Google Trader. They don’t operate under the same development/grant funded subsidization that a lot of others do in Africa. Even if their goal was not to make a profit on this service, they still need to cover internal costs, as does every organization that isn’t provided with free money. This space in Africa, of offering services to the poor (in lieu of the governments actually doing their jobs), has been primarily “owned” by large development and aid organizations. This has created a false floor for the economy, as projects and initiatives are propped up by outside money and services rarely have to survive on their own. This is changing, as low cost and high value options come into the market, be they mobile phone operators providing new communication opportunities, or cheap chinese batteries and LED lights for local energy/lighting needs. I’m sensing a flux in the space, like two bull buffaloes before they fight, the heavyweights in the aid industry and in business are circling each other before they knock heads. The marketing is over who is helping the poor and marginalized in Africa best. In the end the market will decide, and regardless of the messages spouted by both sides, the “poor African” will choose the winner. If there’s a problem with collusion and price fixing in an industry (like there sometimes seems to be with SMS services in a country), that’s something beyond the scope of individuals and needs to be tackled separately by regulation. However, that’s not the case here, we have expensive SMS services in East Africa, but the new entrants into the space always offer low rates, and the costs of switching providers is relatively low. No, this is market-based competitive services and both non-profits and for-profits have the right to offer them at whatever price they like. Equally, individuals have the right to use it or not, be they premium SMS rates or not. I’d like to hear some other African’s thoughts on this. Do you want big multinationals like Google and MTN coming in and providing their services to you? Should we be asking questions for the poor, or is that condescending in itself? What is the sticking point here, and is there a side that I’m missing? Yes, I saw your blog post where you speak in detail about the pricing. However, what is written is not quite accurate. 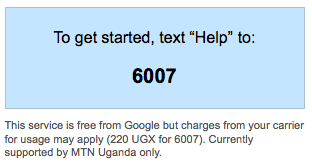 You see, Google, Grameen and MTN launched three types of mobile services yesterday: Google SMS Tips (targeting low-income, rural users primarily), Google SMS Search (urban, mainstream) and Google Trader (all users). The second service is somewhat similar to other “premium SMS” content services currently available (except that it is built on Google search technology) and therefore, is the same price as other content services. To accommodate the first group, we have priced Google SMS Tips at half the price of a content service; this is available for the cost of a person-to-person SMS, which many rural individuals are willing and able to afford currently. The third service drives income and livelihood benefits, so we decided to begin charging at the normal content service rate and monitor whether this excludes rural communities or not (we did extensive testing during the pilot, which included pricing discussions and most of the users found that Google Trader provided far greater, direct value than the 110 shilling price difference). For all services, we are offering them for free for the first few months, just to ensure that all users have an equal opportunity to try them out, risk-free and allow them to access critical content during this period so that they can assess whether or not they would like to continue to use the service. I hope this helps provide a bit more information that clarifies the questions raised. Back in 2004 Grameen started to replicate in Uganda what they had done in Bangladesh with their Village Phone Operators. That is, they would go 20km beyond the best phone signal and provide a loan to a lady in the village that would let her buy a phone and an antenna that would extend the range of the network. The lady would then resell services to local individuals who didn’t have access, or the ability to buy their own phone. I’m actually quite impressed with this initiative, as it fits in perfectly with Grameen’s mission: providing opportunity through the most basic of mobile phones. All of these services work on SMS-only phones, so anyone with a single bar of coverage and a phone has access to a lot of knowledge in their hands. I remember a conversation a couple months back with Sian Townsend (Google) and Ken Banks (FrontlineSMS) about how they did the field studies for this project. 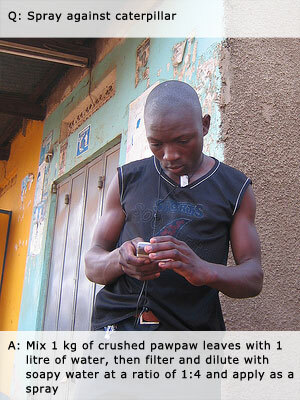 Sian shared with us some of her research on mobile user experience while in Uganda – it was extensive. Through a month of rapid prototyping and studying how users were actually using the new services, the team quickly learned what was important and how to better serve information up to the end-user. Though I haven’t been able to personally test the services yet, with this group, I would expect the results to be better than average. For instance, Google doesn’t tend to get involved with ideas that don’t scale. I imagine that they see replicability with both SMS Search and Google Trader in many other countries as well. 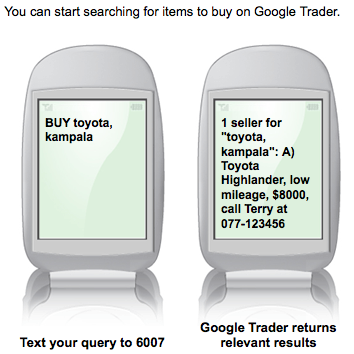 Rachel Payne, the country manager for Google in Uganda, has a blog post here, but not much more information on the long-term plans for Google Trader. I’d be interested in seeing how this compares to Esoko out of Ghana.